Pyjamas are no longer the nightwear simply confined to your bed room; rather they have transformed into the latest fashion trend. Regardless of whether you are shopping, hanging out or even at the workplace, pyjamas can be turned into great outfits. For those who still believe that wearing pyjamas gives a nightwear effect, attempt pairing them with your preferred jewellery, sunglasses, bags, belts and other accessories. 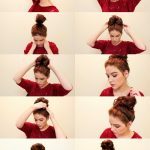 Styles up your hair slightly and put on a bit of natural makeup and you won’t believe the great results you’ll get. After all if models can wear pyjamas at runways, why can’t you keep wearing them for everyday tasks? You’ve probably overlooked this trend for the last couple of years or so, given that pyjamas are for bedtime rather than daytime. However, At Milan fashion week, the superstars of street style dressed in matching silk jimjams with heels and looked absolutely normal in the tricky transitional weather. Silk is great in the heat, in the same way pyjama pockets are good for carrying car keys and loose change and big iPhones. Just like all good trends, instead of dying off the pyjamas has actually grown since 2012 smoothly through Celine, Jonathan Saunders to H&M and M&S and are now here to stay. Here are a few ideas on how to successfully wear pajamas — or silky, dazzling clothes that look like pyjamas — out of the house during the day. To begin with Monday or Tuesday most likely isn’t ideal. But Friday and the weekend are a wonderful time to try out the casual style. What you wear it with is certainly the most important part of all. 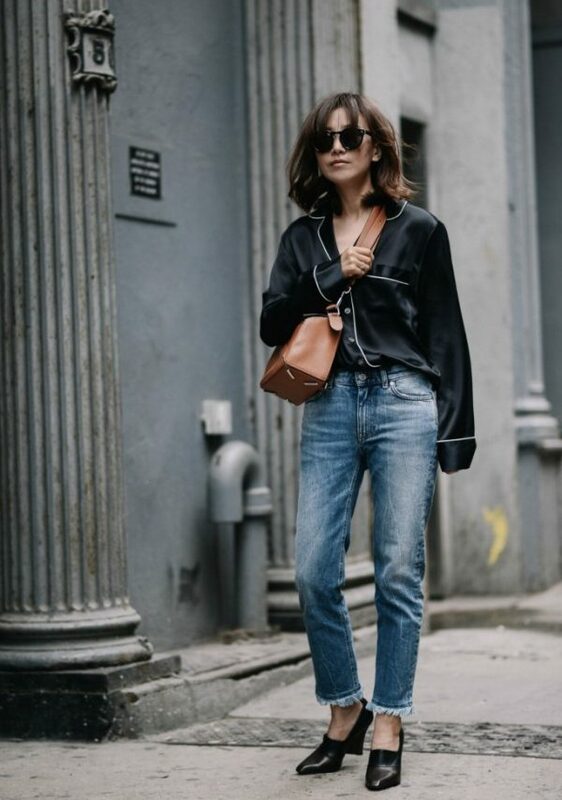 A beautiful and magnificent Olatz button-down pajama shirt appears great when matched with a boyfriend jean by J Brand as do wide shiny pyjama pants paired with classic shirt. One can possibly get away with wearing a pyjama by fitting it up with a fancier shoe. 1960’s-esque pair of silk cropped pyjama pants would look perfect with a ladylike pair of shoes like Bruno Magli’s velvet pointy toe kitten heels. But sportier shoes are a more suitable fit for sweatpant-like pyjamas. The key, however, is high quality. Pyjama dressing suggests an attractive blouse-like pyjama top or silky flattering pyjama bottoms. No college sweatshirts, no cartoon bottoms and definitely no slippers. So how about getting your blazers out and matching them with your pyjamas? This is definitely the most unique look that can be created with pyjamas. An exceptionally unusual and yet interesting combination. Absolutely lovable! If you would like a professional look, this could be the recommended outfit, alongside wedges or high heels. Crop tops offer such a classy look when paired with pyjamas. Should you want a baggy look, opt for a loose fitted crop top. If you don’t want that, what about knotting up the shirt in the front? It’ll certainly give a whole new look to the outfit even while flaunting you beautiful waist. By putting on the shirt and pajamas of the same print or color, an incredibly fascinating jumpsuit effect is made. 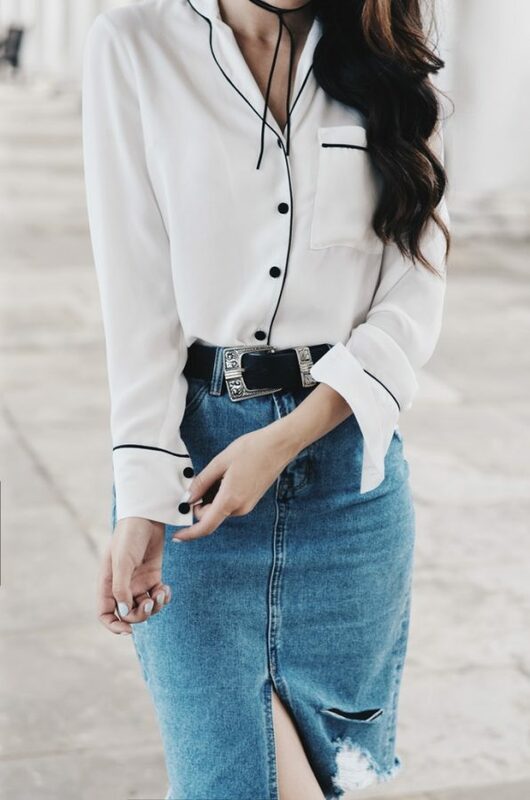 You can actually add a belt to this outfit too. 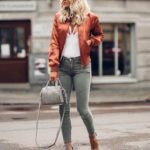 Jackets are a great help for layering your outfit and creates a unique look. You have the choice of either keeping it plain or adding your favorite jewelry.